I had picked up this gorgeous yarn at Artfibers and was searching for a pattern to show it off. The Gossamer Stars patter from the Summer Interweave, seemed just it. The pattern is a small enough chart that it's easy to follow, and while not quite mindless, goes quickly. 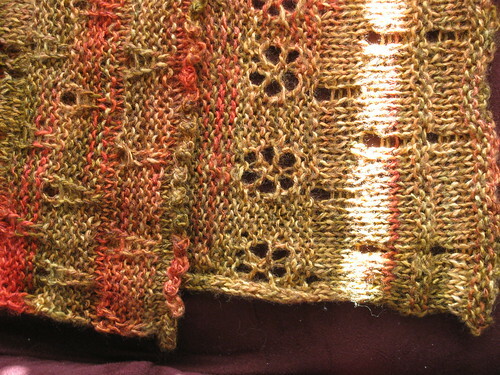 The pattern suggests using a provisional cast on, knitting one side to the end and then picking up and knitting the second side. While I typically am not one to worry about whether all my stitches face the same direction when I wear it, I was interested enough to see the results. (It looks nice, I don't think it makes a huge difference with this pattern.) 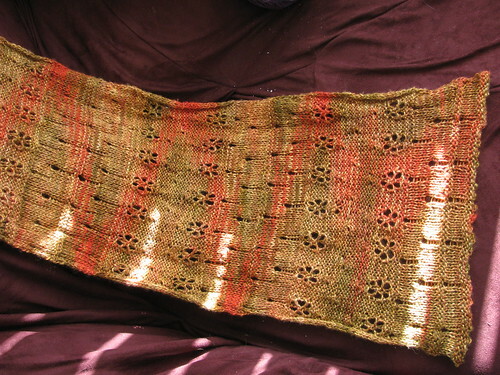 Also, the patterns use of stockinette and reverse stockinette, means it looks pretty interesting from both sides.